VEMS PnP for 944 2.5 8v Turbo offers full control over your engine and even allows further features and control that the stock ECU is incapable of offering. NOTE : Image shows optional ignition upgrades. No longer are you restricted to using a MAF/AFM to measure the amount of airflow you are getting and no longer restricted in the design of your intake system like when having to use a MAF. The ECU is a straight drop in with out requiring any additional wiring to function, however it is recommended to use the supplied wideband lambda sensor for fuel tuning and built in MAP sensor for load sensing. Bosch LSU 4.2 Wideband sensor and extra wiring. Bosch air temp sensor and a patch cable. This kit is meant to replace your Porsche 944 2.5L 8v Turbo engine ECU. The software is free and can be downloaded from here VEMSTune , make sure you download the latest nightly version. 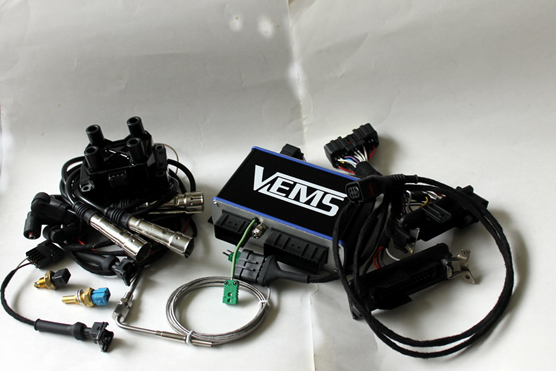 Other installation options are available (retrofit VEMS into stock ECU case / VEMS with OEM ECU connector) . Contact PNPECU.COM for more information.